My first visit to the Bett Show at Excel in London. 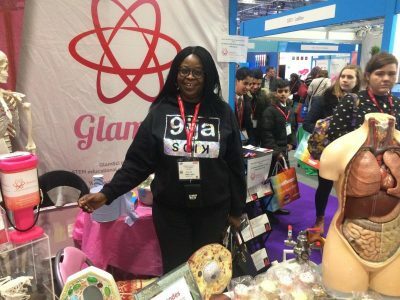 The BETT show is billed as the world’s leading education show and it has lived up to its promise despite the British weather. Four days of learning, playing, listening and connecting with fellow educators and innovators. After Day 2, I can say it is a once a year opportunity to get acquainted with the latest education technologies and trend. I was like a child let lose in paradise! My five senses were engaged to the max, I got to play (try out lol) with kits, immerse myself in VR escape rooms, control robots, compare Microsoft app on Surface pro with Google Suite on Google Chrome, ask questions etc. That’s just a snippet. Here’s more. The seminars I attended were enlightening, Inspirational and challenging. I attended a few of the Post 16 seminars to have a feel of how STEAM education is helping students prepare for University and employability. The seminar on the life of a digital child was an eye-opener, I loved how the students collaborated on their Microsoft Surface Pros to bring their product (A smoothie) to market (in the school lol) using the STEAM skills they learnt. They did the research, brainstorming, presentation, they also designed and produced the packaging and even shoot an ad to promote their product on the screens in school. Hint: If your kid loves Youtube, get them to become Youtube Creators rather than consumers! For those of you that think it is only in Nigeria that things don’t work, I have news for you. There was connectivity “tech issues” with quite a number of “live demos”. One of the takeaways for 9ijakids is to encourage our kids to develop STEAM skills by learning, experimenting and making. We are bringing back lots of STEAM kits, watch this space! I was a bit disappointed that there wasn’t much to see, learn or hear about Special Needs education. It was light touch, there were very few Special Needs products on display and in my opinion, the seminars did not address trends, learning or improvement in this area. However, there was a lot of focus on effectively managing students’ behaviours in classroom which isn’t a big pain point for educators in Nigeria. STEAM? No, it was Coding overload. It was Coding overload. I am sure 80% or more of the exhibitors had a coding product, you had the feeling that STEM /STEAM is about coding or nothing. There were lots of coding kits, coding play mats, coding toys, coding games and coding apps. What of SCIENCE, ENGINEERING, ART and MATHS? They were there too, it was like finding a needle in a haystack. You needed a microscope to find other STEAM products. To be fair, you can design / engineer a product in cardboard and control it with a Raspberry pi, Micro-bit or another micro-controller. However not every problem requires a coding solution! The @MITScratchTeam team did a #Scratch dinosaur meets #microbit workshop on the fly. The dinosaur was supposed to change colour whenever the presenter jumps, but it didn’t, and they had to sort out some bugs in the program #live to make it work. Just goes to show that even expert coders need patience and tenacity! Overall, the coding kits didn’t hit the gender mark in my opinion as I felt the robots, cars etc appealed more to boys than girls. Could we see coding products for girls and boys next year please? Teachers, I have news for you. Join the Fujistu’s Ambassador program online to gain digital skills for FREE and you get certificates to show your competency (you can post them on your LinkedIn profile). 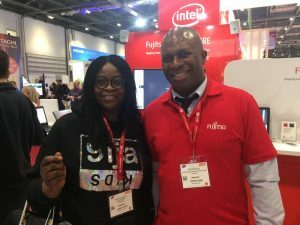 Teacher Takeaway from @fujitsu, thanks to Gbenga. Thanks to the @blackberry team for giving away much needed coffee latte! Thanks to Luisa Calvo “Wicked Caricatures” for the amazing caricature, what a nice end to the day! I’m loving every day @#BETT2019!